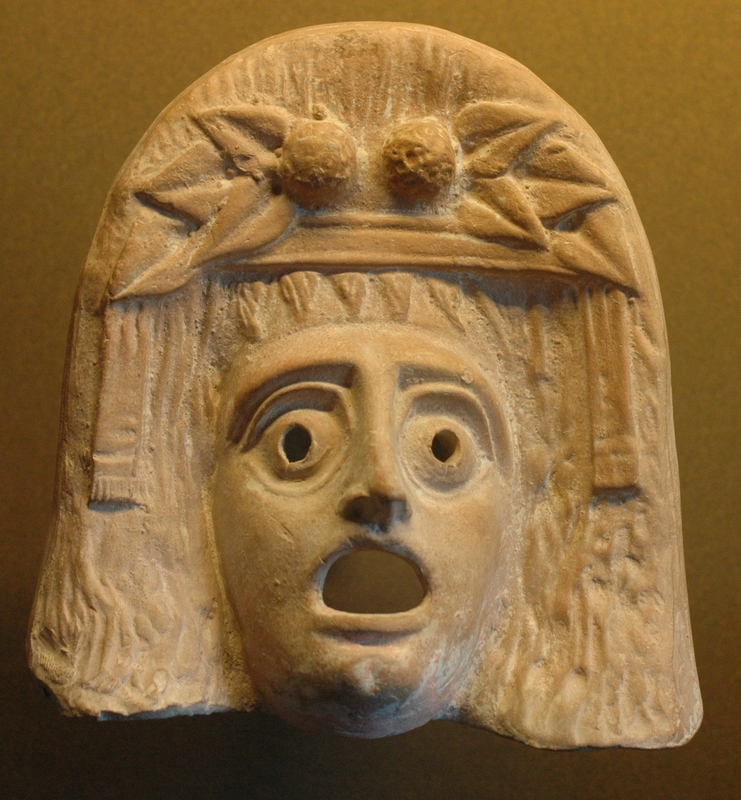 Greek Dionysus mask at the Louvre. Recently, I was accused (rather unjustly) of being a hypocrite. I had said nothing to warrant said name-calling. The only thing I can figure is that, because I shared some information from the Bible and admitted to being a Christian, this person (a Wiccan) decided right out of the gate that I must be a hypocrite. We all know that Christian/Bible-believer = hypocrite, right? See, the thing is, though, I AM a hypocrite, and I told her so. We are ALL hypocrites, whether we want to admit it or not. Do you REALLY live according to what you believe EVERY DAY, unswervingly? Really? If you do, you’re a much better person than I am! Since this is “Word Wednesday”, let’s look at the definition of the word from Merriam-Webster. Hypocrite (n): a person who claims or pretends to have certain beliefs about what is right but who behaves in a way that disagrees with those beliefs; a person who puts on a false appearance of virtue or religion; a person who acts in contradiction to his or her stated beliefs or feelings. The original Greek word Hupokrites, from which “hypocrite” is derived is even more simplistic and in-your-face when it comes to its definition: an actor, stage player, a dissembler (one who hides his/her true feelings or opinions), pretender. If I say I hate what God hates, yet I practice the sin of sexual immorality, I am a hypocrite. (I have, and I am). If I say I want to want to obey the greatest of God’s commandments (to love Him with all my heart, soul, mind, and strength), yet I spend my early morning hours browsing Facebook instead of spending time reading His word and talking to Him, I am a hypocrite. (I have, and I am). If I say I follow the second greatest commandment to love my neighbor, yet I pass homeless people on the street without even offering a dime or an encouraging word, I am a hypocrite. (I have, and I am). If I say I’m against abortion because God Himself is against the taking of innocent lives, yet I stand silent as millions of unborn children die under the knife every year, I am a hypocrite. (I have, and I am). If I say I trust God, yet when the rent’s due and there’s not enough money in our bank account to cover it, I get all panicky and filled with anxiety instead of praying and believing that God will provide for me because He provides for the sparrows and the lilies, and I am so much more important to Him than they are, then I am a hypocrite. (I have, and I am). If I believe that belief in Jesus Christ and His sacrifice on the cross is the only way anyone will be saved, yet I back down from sharing that truth with others because I don’t want to offend anyone, I am a hypocrite. (I haven’t, though I’ve wanted to, but I’m still a hypocrite at heart). I didn’t continue that Facebook conversation with that Wiccan woman because I felt like it would only dissolve further into argument and abuse, and I didn’t want to subject myself to that. I can only pray that the truth of my words (and their true intention) will one day pierce her heart and that she might, one day, start seeing things in a different light. See, I understand how she feels. I understand where she’s coming from (although I’ve not ever been a practicing Wiccan, thanks to the marvelous grace of God!). When I was younger, I thought the same thing about the people in churches. I’d see marriages that were instituted in the sight of God falling apart in infidelity; I’d see people judging and condemning sinners “greater than they were” sight unseen. I’d see people in the congregation who were supposed to be worshipping the One True God and thanking Him for all He’s done for them not singing along with the worship music at all, and if they did, their faces were so contorted with bitterness and/or boredom and/or sadness and/or apathy, that you couldn’t tell whether they were singing hymns of praise or a funeral dirge. Where is the fire? I wondered. Where are the passion and the joy that they say they have? They’re a bunch of hypocrites! Well, yes, they were. Probably some of them still are. But now that I’m older, I understand that to be human is to be a hypocrite, especially when it comes to spiritual matters. We all fall so short of the glory of God that we’re naturally going to fail Him – every day – even if we belong to Him. We’re all going to mess up and do something we said we’d never do, or we’re not going to do something we know we should do. That’s just part of the human experience. Unfortunately, those who don’t belong to God see us Christian humans behaving in very unholy human ways, and they use that against us. They use it as an excuse to not come to God. Truth is: I’m no better than anyone else. I’m not. The only thing that sets me apart from people who aren’t Christians is that I have a personal relationship with Jesus Christ. That’s it. I have been changed on the inside because now I have God’s Holy Spirit living inside me, but I’m still human. I’m still going to sin against my God daily. The only difference now is that I know I need someone to save me from my sins because there’s no way I can do it on my own. Thank God He’s already arranged for the salvation of the world through the blood of Jesus Christ His Son! I wouldn’t be who I am without that gift, although I would still be a hypocrite – maybe even a worse one than I am now. Fantastic post Mishael. Put on Medium.